This recipe combines my mom’s recipe from the 1970s with my own efforts to create a recipe that uses less oil and honey, without compromising either the taste or appealing crunch. This makes a large quantity — perfect for giving some away — that must be baked in separate batches. Use any combination of dried fruits that you like or have on hand; my favorite is half apricots and half cherries. This is especially good atop plain yogurt and fresh fruit. Preheat the oven to 300 degrees. On separate baking sheets, toast the sunflower seeds and nuts for 8 minutes, and a combination of the sesame seeds and wheat germ for 5 minutes; let cool to room temperature. In a large bowl, combine the toasted seeds and nuts with the oats, bran, cinnamon, nutmeg, and orange zest. In a saucepan, heat honey and oil together just until runny, then remove from heat and stir in vanilla and orange juice. Pour honey mixture over dry ingredients and stir until well combined. Divide half of the granola mixture between two large, shallow baking sheets and spread out evenly. Bake at 300 degrees in the upper and lower thirds of the oven, stirring the granola and switching the pan positions after 15 minutes. Continue baking for another 15 minutes or until golden brown, checking and stirring every 5 minutes. In a large bowl, combine the granola with the dried fruits and stir to combine. Prepare pans to cook the second batch, following the above directions. Once the remaining batch is cooked, add to the rest of the granola and cool, stirring occasionally. 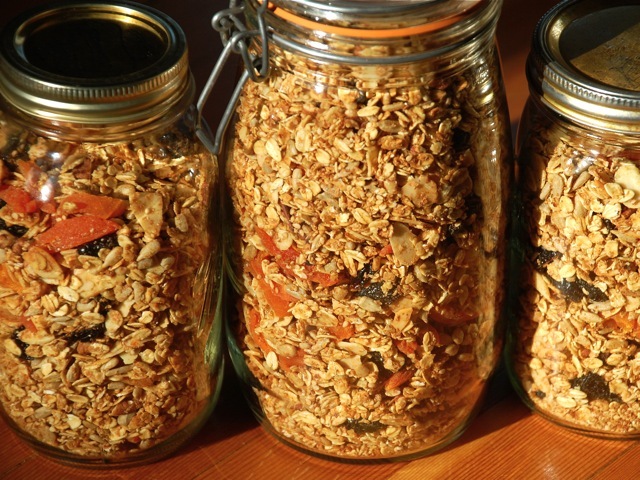 To streamline making granola, I often substitute (pre)toasted, sliced almonds and roasted sunflower seeds (which I purchase at Whole Foods or Trader Joes). Also, this recipe is extremely flexible, just stick with the ratio of wet to dry ingredients. If you don't have wheat germ, substitute flax meal. Don't eat wheat? Leave out the wheat germ and wheat bran and substitute the equivalent in oats or nuts. The variation I make most often consists of all almonds (3 1/2 cups) and dried cherries. For Christmas granola I like a combination of hazelnuts and dried cranberries with extra orange zest. Be sure to read Carrie Floyd's Kitchen Limbo on the pleasures of feeding granola and other healthy foods to kids.